This is a GIANT bomb but so yummy good! 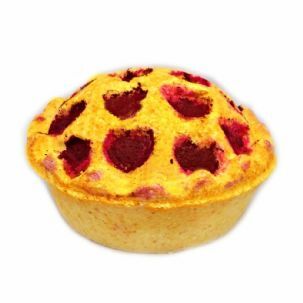 This gorgeous pie-shaped bomb smells of ripe strawberries, tart rhubarb and a touch of sweet buttery pie crust. It is a yellow base with streaming colour embeds of hot pink, so it's a real show-off in the water. Who doesn't love PIE!